OSAGE | A year-long quilt show, inspired by a popular book about quilters, has begun at the Mitchell County Historical Society Museum. And while all the quilts are alike – they are, at the same time, all different. This is how they are alike: All use the Sylvia Bridal Sampler quilt pattern, as created by Elm Creek Quilts, and all were fashioned over a two-year period with the help of classes at Debbie’s Quilt Shop in Osage. The sampler quilt is massive in effort and design: It encompasses, if created in full, 140 pieced, appliqued and paper-pieced blocks that are finished in 6-inch squares –half the size of the traditional 12-inch quilt squares. But this is how they are different: Each quilter uses different materials and colors; some quilters have sewn the entire 140-block pattern, while others have shortened ornarrowed the quilt. All are inspired by author Jennifer Chiaverini, author of the Elm Creek Quilt novels. The sampler is part of her sixth book, “The Master Quilter.” Staff at a quilter’s retreat decide to create the quilt to celebrate the wedding of the retreat’s founder – Sylvia -- with each asked to contribute a 6-inch-by-6-inch block expressing what Sylvia meant to them. Readers of the book expressed interest in creating a real sampler, and the pattern book was created. At Debbie’s, Annette Ashbach taught the class. Each month to month and a half, a new quilt will be placed in the quilting corner in the museum. The very first quilt on display was created by Jane Rowe. Her quilt includes the full 140 blocks, which resulted in a 93-inch-by-115-inch size. The reaction most have when seeing the quilt for the first time is a catch of breath when viewing its size and its density of color and technique. There is no duplication to the patterns from one block to the next. Rowe joined others at Debbie’s “to step out of the box,” she said, and tested her skills when deciding to participate in the class. The blocks varied in the time taken to create them – one could take a few hours, she said, while others five or six. One of the blocks has over 80 pieces of material; another has over 70. But that is what made it interesting, she said. The ability to fashion the pieces along favorite color lines and material types was fun, too. She chose a creamy color – called Antique Textured Scroll—to use as background for most of her pieces. The choice, she said, provided some shimmer to the pieces, as well as neutral back that allowed other colors to pop. You will see some purple in the quilt – Rowe’s favorite color. Rowe, the daughter of Glen and Dorothy Krogstad, is an Osage native, who began sewing when she was 10 years old, and a member of 4-H. She and her husband, Dave, live in Osage. “I was lucky enough to have my cousin, Thelma (Witt) Fromm from rural Plymouth, be my mentor,” she said. Fromm helped Rowe prepare pieces for the county fair. She advanced to sewing her own clothes and, following graduation, enrolled in the two-year fashion merchandising program at Iowa Central Community College. That experience brought her into fabric stores on a regular basis and helped to maintain her love of sewing. 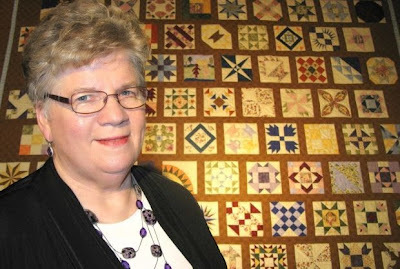 Her interest in quilting came with creating simple tied baby quilts and she began taking classes from Cassie Kloberdanz, where she learned hand-piecing and hand-quilting. That was where her “quilting fever,” as she calls it, began. Since then she has made numerous quilts, wall hangings, table runners and quilted bags. She especially enjoys making fun-themed quilts for family. My name is Jane (Krogstad) Rowe. I am the daughter of Glen and Dorothy Krogstad of Osage. I began my sewing adventure when I was 10 years old and a member of the 4H program here in Mitchell County. I was lucky enough to have my cousin, Thelma (Witt) Fromm from rural Plymouth, be my mentor. I went and stayed with her for 3 days and she helped me make several 4H sewing projects for the Mitchell County Fair. After this sewing experience, I enjoyed making many of my own clothes. Upon graduation from Osage High School, I attended Iowa Central Community College in Fort Dodge, where I enrolled in the 2 year Fashion Merchandising Program. We alternated by going to classes for 9 weeks and then worked in a retail store for 9 weeks through out the 2 years. I was fortunate enough to work at several fabric shops during the program, so I was able to continue my "love of sewing". My interest in the quilting world began after I married David Rowe and moved back to the Osage area. I started out making simple tied baby quilts for friends. Then in the early 1980's I took a quilting class in Osage from Cassie Kloberdanz. Cassie taught us to "hand piece and hand quilt" our small class projects. I still have the quilt blocks that we made into small decorative pillows from Cassie's class. Thus the "quilting fever" began and I have not looked back since that time. Over the past 35-40 years, I have made numerous quilts, wallhangings, table runners and quilted bags as gifts for friends and relatives. I like to sew different projects with new colorful fabrics. Now, I especially enjoy making "fun themed quilts" for my two grandsons, Adler and Cohen Rowe, who live close by, along with our son and daughterinlaw, Joe and Pam Rowe. I challenged myself to "step out of the box" thus bringing us to "Sylvia's Bridal Sampler" designed by Jennifer Chiaverini of Elm Creek Quilts. 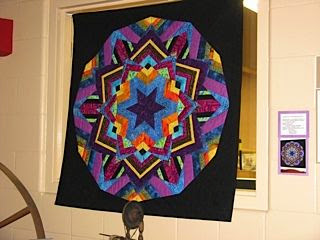 I was visiting with some fellow quilters while shopping at Debbie's Quilt Shop back in 2009. They asked if I would be interested in taking this "2 year" class. This class was meeting only once a month and the participants would only have to make anywhere from one to six " 6 inch" blocks per month. Well, I said "O.K." I would give it a try. So the first month I only made one "6 inch" block. Needless to say, I soon discovered that if I was really going to make this quilt composed of 140 "6 inch blocks", I definitely needed to make 6 blocks per month. So for the second class, I made a total of 11 blocks to make up for the first month that I only made one block. I really enjoyed this class. Some months the blocks were very challenging, but our instructor, Annette Ashbach, did a good job of explaining the techniques we needed to know to accomplish making the 6 inch blocks. Paper piecing, "Y" seams, and applique were the most challenging for me, along with sewing a 1/4" seam allowance so the blocks would turn out to be 6 inches finished. I am very happy with how my Sylvia's Bridal Sampler Quilt turned out and am glad to share it with others to enjoy. 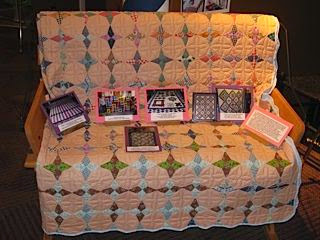 Jennifer is the author of the very popular Elm Creek Quilts novels – a total of 32 books – www.elmcreek.net. In her 6th book, “The Master Quilter”, the staff of the fictional quilters’ retreat in central Pennsylvania conspire to create an extraordinary sampler quilt to celebrate the wedding of founder Sylvia Bergstrom Compson to her beloved Andrew. Friends and family of Sylvia are asked to contribute a 6x6 block expressing what Sylvia means to each of them as a quilter, teacher or friend. As the quilt blocks accumulate, the Elm Creek Quilters celebrate the joy of new beginnings and the ongoing success of their business – until forces conspire to threaten their happiness and prosperity. 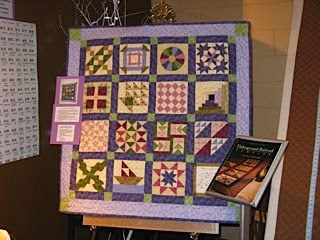 Readers of Jennifer’s books remarked that they would like to make one of these quilts for themselves. Jennifer Chiaverini and 72 of her real-life friends and fans contributed 140 blocks to this beautiful sampler quilt that became Sylvia Bergstrom Compson’s wedding gift in “The Master Quilter”. When Jennifer’s fans requested the patterns, Jennifer was inspired to create the Sylvia’s Bridal Sampler book, blog and gallery.That is how the pattern book, Sylvia’s Bridal Sampler from Elm Creek Quilts came to be. There are 140 pieced, appliqued and paper-pieced blocks and are a finished size of just 6” square. The fabrics in Jennifer Chiaverini’s first fabric line for Red Rooster Fabrics were inspired by the lilacs, roses and ivy, elms and other natural elements in the gardens at Elm Creek Manor, Sylvia’s ancestral home and the site of quilters’ retreats. 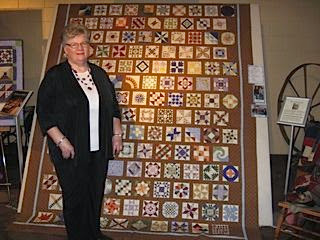 The quilts being presented in the Mitchell County Historical Society Museum, located in the Cedar River Complex, were made during a 2 year period with classes at Debbies Quilt Shop in Osage, Iowa. The quilters are: Jane Rowe, Minerva Wagner, Syd Heimer, Deanne Eisenman, Shirley Penney, Nancy Minnis, Glenda Newstrom, Annette Ashbach, and Teresa Dorsey. They will be exhibited individually over a one year period with special features about each quilter. Master Quilter had discovered new love in her golden years, Andrew’s son and daughter were reluctant to see their widowed father remarry. Rather than hold a ceremony his children would not attend, Sylvia and Andrew celebrated a surprise Christmas Eve wedding in the ballroom of Elm Creek Manor, surrounded by their dearest friends. After enjoying a honeymoon in New York City, Sylvia and Andrew traveled to Andrew’s daughter’s home in Connecticut, where they announced their big news and took their first steps toward reconciliation. Eventually Andrew’s children realized how misguided their objections had been, and they welcomed Sylvia to the family with warmth and affection. Andrew’s children were not the only ones to have been momentarily confounded by Sylvia and Andrew’s surprise wedding. Because the Elm Creek Quilters had not expected the couple to marry so soon, they had not sewn even a single stitch for the wedding quilt. Rather than delay presenting the newlyweds with a gift befitting the joyous occasion, the Elm Creek Quilters requested 6-inch blocks from Sylvia’s friends, colleagues, and former students, a wonderful variety of blocks that became Sylvia’s Bridal Sampler. “Jennifer Neidenbach Chiaverini was born in Cincinnati, Ohio, but grew up in Waterford, Michigan and Thousand Oaks, California. She received her BA in English from Notre Dame and her MA from the University of Chicago. After graduate school she moved to State College, Pennsylvania where her soon-to-be husband, whom she met three years before in an undergraduate creative writing course, was working towards her Ph.D. in mechanical engineering at Penn State. There Chiaverini taught part-time for the English department – and struggled to launch her writing career. up the apartment the Chiaverinis would soon share. Unfortunately, she had no friends or relatives who quilted and could be counted on to make her a quilt for a wedding gift, nor did her tight budget allow her to purchase one. Before long it became obvious that if she wanted a beautiful heirloom quilt she would have to make it herself. At that time, State College did not have a quilt shop, so she bought an instruction book and fabric from a discount store and taught herself to quilt. Her passion for quilting quickly grew. Before long she bought herself a sewing machine and taught herself machine piecing and rotary cutting techniques. After the wedding, Chiaverini continued to teach at Penn State and quilt – while she stumbled through the first pages of her novel. She knew she wanted to write about women and their work, and about valuing the work women choose to do. Friendship was another theme she wanted to explore, especially women’s friendships and the way women use friendship to sustain them and nurture each other. She even had a vague idea about two of the characters, a young woman and her older and wiser friend. Yet she struggled to get beyond the first few paragraphs of any story she started. Thus, Chiaverini’s first novel, The Quilter’s Apprentice was born. She sent it into Simon & Schuster and had it snatched up from the slush pile by a young editor. The Quilter’s Apprentice immediately hit regional bestsellers lists and sold out at quilt shows across the country. Letters started pouring in from readers asking what happens next to the Elm Creek Quilters. Chiaverini was wisely instructed by her editor to develop a series based on these characters.